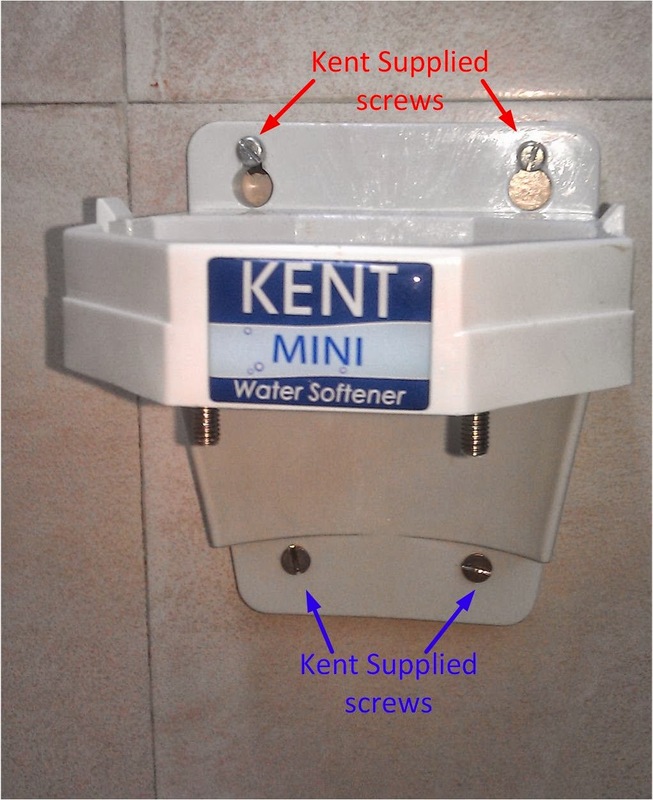 I recently bought a Kent Mini Water Softener for my home in Wakad, Pune, India. I ordered it online for INR 6000/- and it was promptly delivered within the week. Due to perennial shortage of fresh water, the limited amount of water that Pimpri Chinchwad Municipal Corporation supplies to our homes is only routed to our kitchen. For bathrooms, we are supplied with groundwater fetched from wells and delivered to out homes by water tanker trucks. This water leaves white stains on the tiles and fittings, interferes with proper washing on clothes, and causes hairfall. The last factor being the most agonizing one that prompted me to get atleast one of my bathrooms fitted with a water softener. Taking bath with hard water left my scalp itchy and hair sticky and rough. 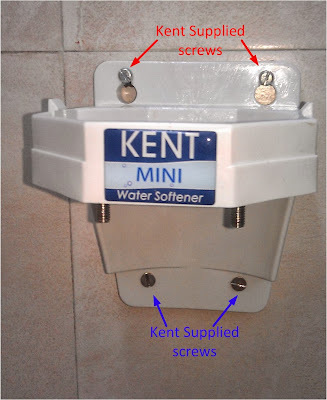 Like most water softener, Kent's Mini Water Softener also works on the principle of ion exchange. Watch this video to understand the principle behind its working. PLEASE NOTE THAT A WATER SOFTENER DOES NOT KILL MICROBES OR PURIFY THE WATER. IT ONLY REMOVES THE CALCIUM AND MAGNESIUM IONS FROM IT. After the delivery of the water softener, I waited for 1-2 weeks for Kent to contact me for scheduling an installation visit from their personnel. Finally, I had to call the service center and explicitly ask them to send someone over for the installation. When the service guy visited, unfortunately there was a power cut and he was unable to carry out the installation (he needed electricity for the drill machine for mounting the water softener on the wall). 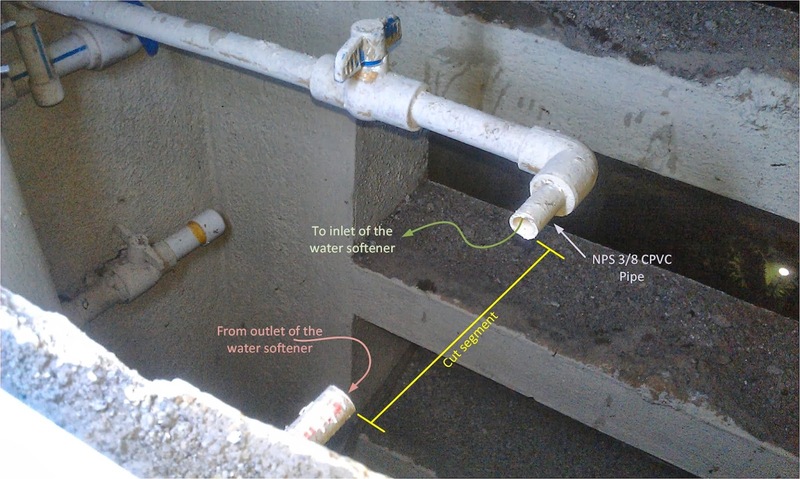 Now I wanted the water softener installed in one of my bathroom, I wanted to be able to use it to softener the water flowing through my geyser and shower (for washing hair). I realised that this would require some extensive work. The service guy had no experience in installing the water softener in the way I wanted. I decided to research and plan this installation myself. So I asked the service guy to not carry out any installation work himself and instead asked him to explain to me the details of the installation process before he left. He was very helpful. refer to this diagram while reading the notes below. 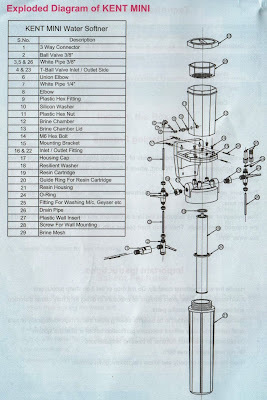 Diagram taken from the user manual. PDF here. 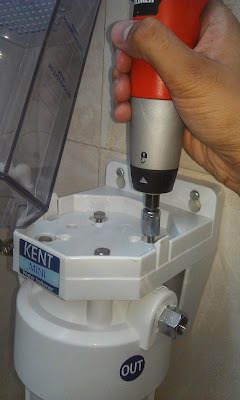 For the wall mount bracket, Kent had supplied four pairs of wall plugs and zinc plated screws. You need an 8mm diameter masonry drill bit to mount these. I used 10mm by mistake (for the upper two mounting screws) due to which I ended up with holes which were too wide for the plastic wall plugs supplied by them. So I had to use some portland cement (grey cement) to narrow the holes a bit again before stuffing the Kent supplied plastic wall plugs in them to make sure they fit in snugly. 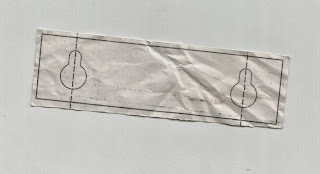 Note that Kent provides you with a sticker to assist with the mounting of the top two holes. 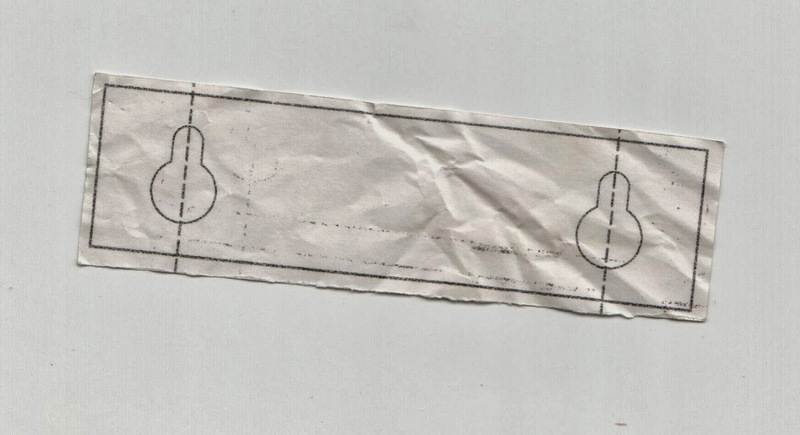 Once the top two holes, you can hang the mounting bracket and then use a pen to mark the bottom two holes. For the lower two mounting holes, I used my own pair of plastic wall plug and stainless steel screws. 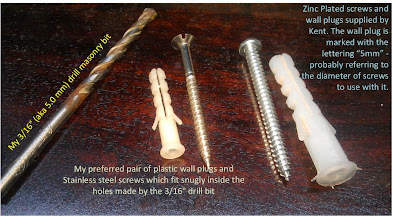 Stainless steel (SS) screws are better than simple zinc plated ones. Also, I have become accustomed to using these particular size and make of SS screws and the associated wall plugs - they go well together and fit really snugly inside holes made by my 3/16" (5 mm) masonry drill bits. Bolting the rasin housing cap to the mounting bracket. 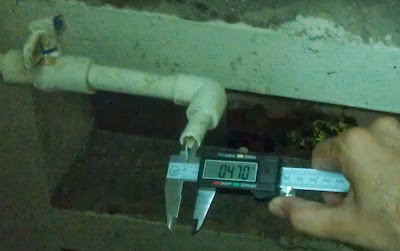 The plumbing of my apartment building is composed to CPVC pipes and joints. There is a segment of NPS 3/8 CPVC pipe (internal diameter 0.473 inch) located just after the main control valve of the bathroom I was working in. I turned off the main valve and cut pipe with a hack saw in two places. A section of pipe had now been removed. I now had the two points on the main piping which I would connect to the inlet and the outlet fittings of the water softener. People make use of different methods to reduce the hardness of water so as to conduct their daily activities in a smoother way. 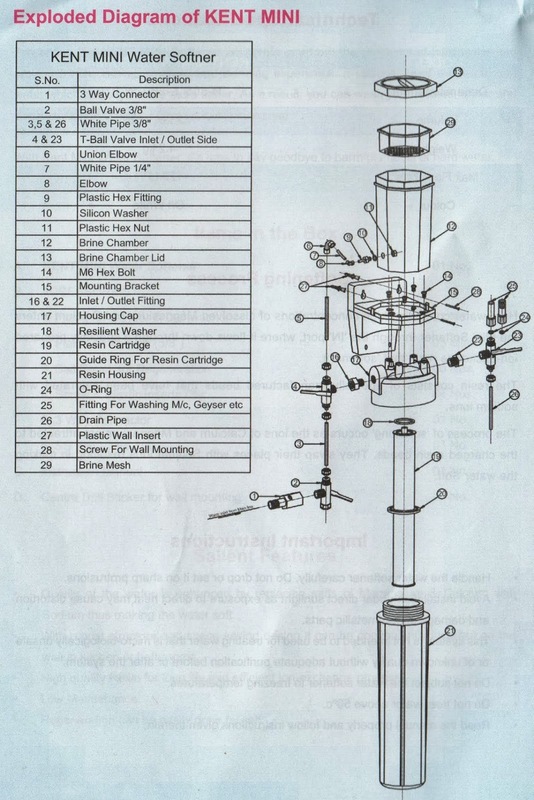 Water Softeners India help in adding performance, reliability and durability to the boiler system. Water hardness leads to dissolving of impurities in water. It adds iron as well as bad odour in the water. Hard water is harmful for our health and can harm us severely. That's why water softening equipment is a must having appliance for your home as well your industry. Nice informative post about this. Thanks a lot for sharing.